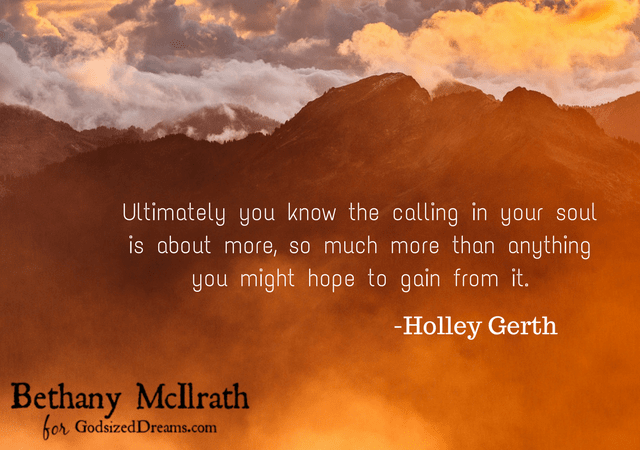 Today, we’re wrapping up our book study of You’re Made for a God-Sized Dream, by Holley Gerth. This is the book that started it all for our group. Ironically, I was a few months into participating in this ministry when I realized the book existed! It’s been convicting and encouraging to read along with everyone. Takeaway: Answering lies about dreams with the truth helps us knock out excuses holding us back from pursuing God’s will. It’s easy to think that God-sized dreams are about results or doing something great for God. The truth is, they’re all about Him! So when we’re wondering if God’s given us a dream, we can start by looking at what He’s already given us—our personalities, strengths, gifts, and passion for serving Him. Takeaway: We can recognize our God-sized dreams by considering how God made us and how our unique composition can glorify Him. Takeaway: If you’ve got the heart of a dreamer, you can make a difference anywhere. Takeaway: If we don’t define our dreams, we can easily get bogged down in “figuring them out” instead of following God along the way. This is my favorite chapter! Holley addresses fear as reasonable and God-given. But, then she explains that fear can get out of hand. Her advice for training fear (like a dog!) is gold. Takeaway: If we avoid fear instead of training it to be useful, we miss out on much of what God has for us. Dreaming isn’t all sunshine and rainbows. Anyone who pursues a God-sized dream knows that too well. Takeaway: We’ll face unexpected and unpleasant things as we dream with God, but we can count on God to always be good and reliable. More than just being surprising or challenging, dreaming can also be full-on disastrous. We can fail. Circumstances may seem to kill our dreams dead. Takeaway: “The Dream Giver is also Dream Keeper.” And, I might add, the One who gives life in the first place and also raises the dead! Takeaway: We need to be “on our side,” seeing ourselves as God does, not as the Enemy wants us to. When I am discouraged in the pursuit of a God-sized dream, this is a chapter to return to. There are many reasons our dreams are worth it. Takeaway: The most important reason our dreams are worth it is that they are all about obeying God and being close to Him! What were your biggest takeaways from You’re Made for a God-Sized Dream? How has this book impacted your dream-walk with God? I’m not worried about where I’m going. I believe God’s Word in 2 Timothy 4:18–He will deliver me safely into His Kingdom. I know my loved ones; they’d trust God with my death. I worry that I might die before I get to finish certain study and writing projects. I fear my dreams might be left unfinished, unaccomplished. And with that, I realize I have an idol issue. Fearing of missing out on our dreams before they’re achieved means forgetting what our dreams are all about. His dreams for us result in the prize of closeness with Christ. The kinds of dreams God gives us are intended to glorify Him. They build up His Kingdom in one way or another. 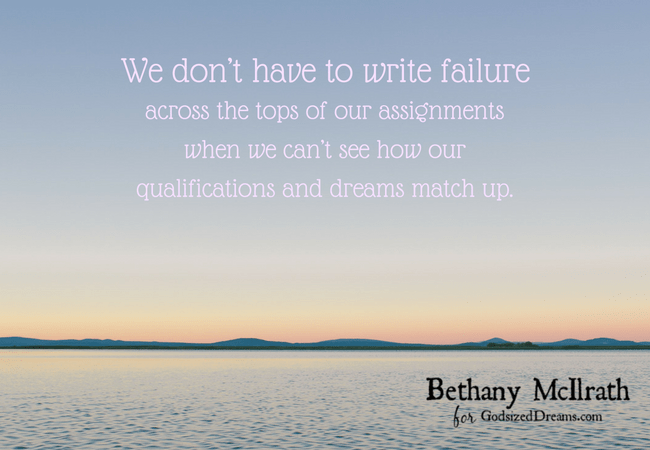 That means that pursuing our God-sized Dreams isn’t just about us. Our dreams are about Him. And He isn’t changing, failing, or going anywhere. Worship is and will be received by God for forever. Maybe you worry instead that you’re going to miss out on your dream because of setbacks or surprising life changes. Fear of failure might be holding you back from even starting. Perhaps you fear because the dream just seems too huge. His dreams for us may not look like we expect. Some aspects that we think are vital might not be. But we know that what He purposes, happens. God will complete your dream in the best way. Thank the Lord fears being realized don’t stop dreams from coming true. We so often wish to “undo” certain things we’ve said or done. Regret and wishing we could “go back” or that events turned out differently is commonplace. But there is such joy and grace in the Lord’s design of time as forward-moving. What a treasure that so many things can’t be undone! When a bad day threatens that you aren’t lovable, it’s a blessing nothing can undo the words of love poured out by your people. When fears are realized and your dreams seem like they’re teetering on the brink of destruction, nothing can undo the steps you’ve taken in obedience. When you see no way around pain, you can walk right through it because God who is with you will deliver you safely. What He has secured will not be destroyed. There is no retroactive ability to destroy what God has already built. What He calls finished cannot be undone. What He says He will complete cannot be left undone. “Forever and ever amen” means today and tomorrow and every day after. The phrase follows prayer after prayer, affirmation after affirmation. We believe in a never-changing, all-knowing, all-powerful God. He’s got forever steadily up and running, and He knows how it all turns out. As we pursue the dreams He gives us, we can know they aren’t possibilities, but certainties. They may not be what we thought they would be, but when our dreams come true they will be what God planned. He who calls us is more than faithful- He is able. And He will. For that I am humbled and grateful. How about you?